While some interesting things may or may not be happening under the hood, the freshly announced BlackBerry Tour for Verizon and Sprint (pictured in Verizon garb on the left) is hardly a departure on the surface. It mostly appears to be a minor modification to the Curve (right), though it does seem inexplicably thicker. The Bold seems positively overwrought in comparison. We didn't get much time to play with the OS, but the screen and the keyboard are pure new-generation BlackBerry charm. 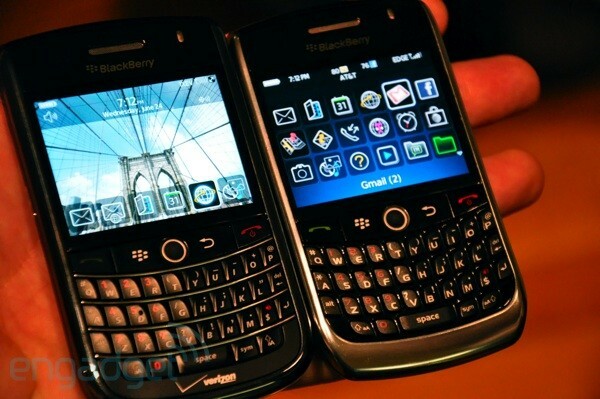 BlackBerry Tour hands-on, wild sibling confrontation with Curve and Bold originally appeared on Engadget on Thu, 25 Jun 2009 14:32:00 EST. Please see our terms for use of feeds. June 25, 2009 by Ben Pike.